The American Metalcraft HMSP2 salt and pepper shaker set is made of stainless steel to resist corrosion and provide durability. 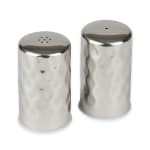 Plastic stoppers help keep salt and pepper in the shakers. An industrial feel is given to tabletops with the hammered finish. The American Metalcraft HMSP2 salt and pepper shakers measure 13⁄4 inches in diameter by 21⁄2 inches tall each, accommodating 2 ounces of product.